Welcome! I am a Vallejo, California native. My parents, as well as my grandparents, grew up here. I have lived in Vallejo for 38 years and I enjoy the mild weather. It's not too hot or cold with the Bay Area breezes. Vallejo is a great place to live. Solano County Real Estate is the most affordable out of the nine Bay Area counties. In Vallejo, we have a great amusement park, a good length of Vallejo waterfront property, a downtown that is slowly being updated, and a Navy Shipyard that was sold to the city that has plenty of commercial and industrial use. There are many restaurants and parks to choose from in this quiet community. By the way, Vallejo is also conveniently located between Sacramento and San Francisco with easy access to Interstate 80. I am genuine, honest, and caring during your real estate transaction. I have excelled in this business to take extra training over and beyond the average realtor. This includes a GRI Designation, SRES Designation, and an ABR Designation. I have sold many different types of properties - single family residences, townhomes, mobile homes, multi-unit, farm property, as well as foreclosure property. Real estate in Vallejo will always be a great long term investment. I was the highest Producer with the number of sales and volume in the Coldwell Banker Solano Pacific Vallejo office in 2007, 2008, 2009 and 2010. Now I work for RE/MAX because RE/MAX Worldwide knows there's no place like home, and it will help you get there. With some 90,000 real estate agents in a franchise network of independently owned offices in more than 90 nations, this real estate leader sells homes from Argentina to Zambia. RE/MAX offers its agents comprehensive training, cutting edge technology, lead support and much more. 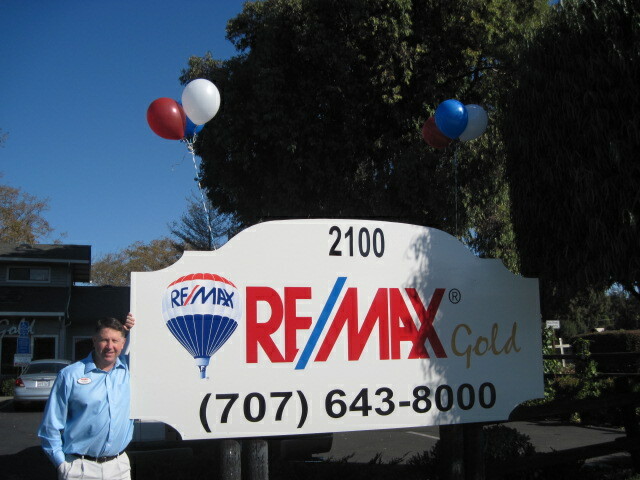 RE/MAX Gold sells more homes each year than any other independently owned real estate brokerage in Northern California and Central California. * We currently serve areas throughout Northern and Central California; from Yuba City to Fresno and Cameron Park to Marin. Besides that, I love my job. I also enjoy many other activities which include scuba diving, fishing, sports (go Giants! ), my 2001 Harley Davidson Softail, and a love for animals. Thank you for visiting my website! Now you have a friend in the Real Estate Business. Please feel free to browse my site for Vallejo Real Estate listings. I can help you sell your home or find the home of your dreams. Contact me.